Lobster tails, with their sweet and tender meat, can be cooked in a variety of ways, but steaming them is one of the easiest. The lobster tail shells need only to be partially split open first, allowing the steam to easily get to the meat. You can use an everyday metal steamer set inside of a pot to steam the lobster tails, which only take a few minutes to cook. Adding fragrant aromatics to the water helps infuse flavor into the lobsters as they steam. Defrost frozen lobster tails overnight in the refrigerator, or sealed in a plastic bag and submerged in cold water if you are short on time. Insert kitchen shears between the meat and the top shell and cut the shell down to the tail. Pry the shell apart slightly where you cut, which will allow steam to get inside the shell and into the meat more easily. Add an inch or so of water in a large pot and insert a metal steamer basket. The water should reach just below, but not touching the steamer pot. You can choose to add aromatic herbs such as rosemary, thyme, bay leaves and garlic cloves to the water, adding extra flavor to the lobster tails. Bring the water to a boil. Add the lobster tails to the steamer basket and cover the pot with its lid. Steam the lobster tails until the shell has turned a deep red and the lobster meat has turned from translucent to completely opaque, about 7 to 8 minutes. Remove the lobster tails from the steamer pot using tongs and serve them immediatley with melted butter and lemon wedges. 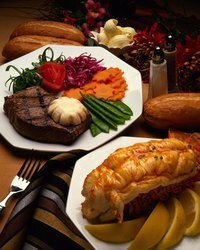 If you are not serving the lobster tails right away, placed them in a bowl of ice water to stop the cooking process, or they will end up overcooked and rubbery. You can gently reheat the lobster tails in an oven set to 170 degrees Fahrenheit. To butterfly the lobster tail before cooking, after you split the shell, loosen the meat from the sides of the shell, keeping it attached only to the base. Lift the meat and lay it on top of the shell. Pull it apart gently like an open book to create the butterfly effect.